Dave Knapp, 86, was a district scout executive for 10 years, and decades later he was asked to return to recruit other adult leaders. He picketed in front of every BSA council office in Connecticut to protest the membership policy. GRAPEVINE, Texas -- After years of dedication to an organization that ultimately didn't want them, former gay adult leaders with the Boy Scouts of America were elated to see the group finally accept openly gay youth. But the moment was tinged with bitterness, because as gay adults, they remain stuck on the outside. Members of the BSA cast the historic ballots on Thursday to change the controversial membership guidelines that had dogged the organization in recent years. “It's a very strange feeling because I think we feel like we've had a great victory, but we still realize that … when we go back to our respective hometowns, we're still not going to be welcome as adults. We're still going to be discriminated against. So as pleased as we are that something has happened, clearly we were left out of this and will continue to be left out for some time,” said Greg Bourke, 55, of Louisville, Ky., who was forced to resign as Asst. Scoutmaster of Troop 325 last year over his homosexuality. “It's bittersweet … and it's frustrating, but it's also motivating because we now have this sense that the BSA is finally willing to change and they've taken the first step,” he added. 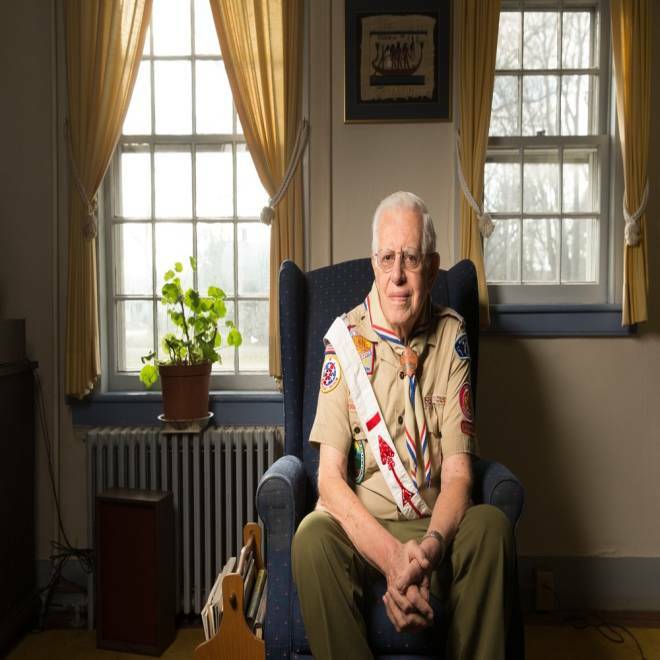 Dave Knapp, of Guilford, Conn., was a district Scout executive for 10 years, and decades later he was asked to return to recruit other adult leaders. He said he realized he was gay later in life. Knapp's method of choice was public protest. He picketed in front of every BSA council office in Connecticut. Jennifer Tyrrell, 33, a lesbian who was ousted as den leader from her son's Tiger Cub pack in Bridgeport, Ohio, used the Internet to get her message out, as did Bourke. As the controversy over the gay ban grew last year, first with Tyrrell's ouster in April, then Bourke's in August and then that of a gay California teen denied his Eagle rank in September, the group of former Scout volunteers turned LGBT activists found each other. “What I think is interesting ... is the way our stories unfolded independently,” Bourke said. “I knew the policy was out there but I really wasn't aware of” the movement to let gays to join. “I was just out there because my son … wanted to be a Scout and my troop needed people to be leaders,” he added, echoing Tyrrell's path to the Cub Scouts for her son Cruz. Though Bourke can still participate informally as a parent, he -- like the others -- misses the deeper connections to Scouting he used to have. “We have this crazy dichotomy where we've been harmed by this organization irreparably and yet we have to defend it all the time and tell everyone how great it is,” Bourke said. Activists, including Greg Bourke, second from left, and Jennifer Tyrrell, to his right, deliver boxes containing 1.4 million signatures urging the Boy Scouts of America to reverse the organization's ban on LGBT Scouts on February 4, 2013 in Irving, Texas. The fight has taken its toll. Tyrrell said it was hard to hold down a job with the demands of an ongoing campaign. Tyrrell said she has severed ties to her former pack, and she won't go back to Scouting until all families are included. But Bourke, whose son Isaiah, 15, is a Scout, still participates informally. Bourke said he stayed because he wanted to dispel the myth that some harm would come from gays serving as adult leaders. Next week, he will lead the Scouts on a charity walk over three days that he has organized for five years. NBC News' Miranda Leitsinger and radio talk show host Michael Smerconish discuss a decision by the Boy Scouts of America to lift a ban on openly-gay Scouts. If you are a current or former member of the Boy Scouts and would like to share your thoughts on how your troop, pack or council is handling the change in the membership policy, you can email the reporter at miranda.leitsinger@msnbc.com. We may use some comments for a follow-up story, so please specify if your remarks can be used and provide your name, hometown, age, Boy Scout affiliation and a phone number.